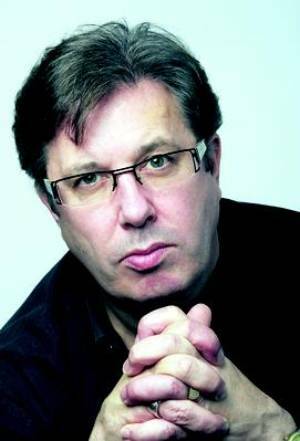 I know many of you reading this have no idea who Gerry Ryan was, but in Ireland he was a cultural icon. Gerry hosted a radio program (or programme) on 2fm, the national radio station. I’ve tried to come up with a similar personality here in the US, but I can’t think of one. Maybe a good comparison might be Arthur Godfrey who’s been gone a long time. Gerry was one of those broadcasters who made you feel like he was talking just to you. Because of the time difference I enjoyed listening to him via podcast, especially when I was riding my bike. He kept me going many times when I really wanted to quit. In some small way, he may have helped me prolong my life. Colm and Jim, it’s all on you now. Gerry Ryan was 53 years old and leaves a wife and five children. I offer this brief, very inadequate eulogy as a reminder that 1) we’re all here for a limited number of years and only God knows when we’ll be called home and 2)we never know when we may be faced with a major change like losing a friend or family member. God has a plan for all of us and we never know what’s in store for us. Carpe diem! Sieze the day! I hope you’ll join me in offering prayers for Gerry, his family, friends, and colleagues, and for his thousands of listeners. Rest in peace, Gerry. You will be greatly missed. Choices. We all make choices. Some are good. Some, not so much. But life is all about choices. It’s kind of like going to the store. You make a series of decisions whether to go straight, turn right, or turn left. When you’re done, you’ve gone from home to the store. What makes this a bad analogy is that when you go to the store, you’ve probably been there before so you’re making choices based on your past experience. Life is different. Sometimes you have experience, or trusted instructions that allow you to make an informed choice. Even if you’ve never been to Cincinnati, you probably know that it’s east of here. You may know that it’s on the Ohio River. But do you know how to get there? Maybe not, but you can get a map or a GPS system and find it fairly easily. But what if there aren’t any instructions? There may be some rules to help you out. If you walk off the edge of a cliff you know that you’re going to fall. So you don’t do that. If you put your hand into the fire, you’re going to be burned. So you don’t do that either. The other day my cat burned her nose on my daughter’s hair straightener. Cat’s don’t know anything about hair straighteners. She’d never seen one before so she examined it the way cats examine everything. She gave it a sniff and she burned her nose. Now she knows. Even with her tiny brain she’ll never sniff another hair straightener. In the first reading today Paul tells his listeners about how God chose his people. He tells them how he chose Saul to be their king and then David. Then in the Gospel Jesus tells the disciples how He has chosen those who are blessed to understand His teachings. Knowing that God can see into the future makes you wonder sometimes why He made the choices that He did. But then I imagine my cat wonders why Megan left the hot hair straightener on the floor. The thing is that you and I have about as much chance of understanding God as my cat has of understanding me. We just don’t have the mind of God. We’re left to make OUR choices based on the information that we have which sometimes isn’t much. But we have the advantage of a God who walks with us, helps us make good choices, and even makes sure that our not-s0-good choices turn out ok. Forty two years ago next month I chose a girl I barely knew to be my wife. Six months later we were married. There’s no way our marriage should have worked. But it did. In spite of our youth and our lack of experience, with the help of God, we made some good choices. I’ve seen some of the guys that Jan might have married, and believe me, she did OK. I’ve also seen some of the women that I could have married , and I did more than OK. Tomorrow, xxxx and xxxx of our parish, will profess their love for one another in front of this altar. They’ve made a choice. It’s a blessing and a miracle to find true love once in this life. But they’ve both found it a second time, and that’s a rare gift. I won’t be able to be here tomorrow, so I’d like to offer my prayers and best wishes to the about-to-be Mr. and Mrs. xxxx xxxxxx and I know all of you do the same. I don’t normally do this, but here’s a post from my business blog, Mining the Store. Normally my two worlds don’t collide like this, but the story is about a creative way an Irish businessman made a donation to a local parish and generated international publicity. I suggested that my business blog readers look for creative ways to help charities and promote their business at the same time. To you I say, how can you get donations from local business that are a win/win for everyone involved? Not what you’d normally expect to find here, but we’re nothing if not flexible. Enjoy. Here’s an interesting story from Irish Central about how one entrepreneur is getting a lot of publicity from a charitable donation. 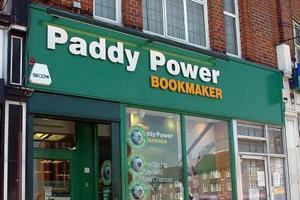 Paddy Power, Ireland’s legal bookmaking organization, has donated more than $15,000 to sponsor the confessional in a local church. When a church fundraiser contacted Paddy Power for a donation, the man himself answered the phone. “Paddy Power was captivated by the thought of a new confessional box,” said Father Michael Griffin, a priest at the church. The location of the church, in the heart of horse racing country seemed like a perfect fit. The first person to visit the new confessional, which features a small plaque reading “The Paddy Power Sin Bin” was jockey, Frankie Dettori. Paddy himself attended midday mass at the church. This story has obviously gotten world-wide attention. What can you do to promote your business in a unique, creative way? How can you give back to the community in a highly visible way that puts you in a favorable light with your target market and that could generate free publicity, just because it’s unusual enough to be of interest to your local (or even national or international) media? Mr. Power certainly got his $15,000 worth, and then some. Not to mention earning himself more than a few prayers from the grateful parishioners. Christians-Where Have They all Gone? I just finished a book called “Prayers for the Assassin” by Robert Ferrigno. It’s a book that I found quite upsetting. The story takes place in the not-too-distant future when the United States has been taken over by the Muslims. Nuclear blasts have destroyed New York City, Washington DC, and Mecca. The capitol of the Islamic States of America is in Seattle, WA. One of the more disturbing aspects of the book to me is the fact that the “Catholics” are pretty much outcasts. Not the Methodists, not the Presbyterians, but specifically the Catholics. Apparently Catholics have converted to Islam at an amazing rate leaving the Catholics at a distinct disadvantage. I find this timely because a recent survey of American religious beliefs found that 65% of Americans consider themselves Christians. On the one hand, you might say that’s good news. Two out of three of us worship Jesus Christ in one way or another. Or, you could take the half-full approach and say that one in three of us don’t. Here’s the thing that worries me. At the hospital where I minister, patients are asked by admitting for their religious preference. This is strictly a guess, but I’d say that between 80-90% say that they’re Christian, either Catholic or one of the protestant denominations. That’s a huge majority. But, when I visit these patients, a fairly large number of the self-proclaimed Christians admit that they don’t practice their faith. Often I’ll hear something like “I was raised Catholic, but I haven’t been to church in 30 years.” On average, I’d say that these nominal Christians might be as much as 20-25% of the total. Sadly, more often than not, the non-practicing Christian is/was a Catholic. So, based on my highly non-scientific experience, if 65% of Americans say they’re Christian, but 20-25% of them haven’t seen the inside of a church in decades, then practicing Christians are just 49-52% of the population. I’d say this is a problem. In just over 200 years our nation has gone from virtually 100% Christian to a state where Christians are just barely a majority. If this trend continues then the book I just finished isn’t so far-fetched after all. It’s time for us, as Catholics, to take a good, hard look at our own faith. What happened to our Church to cause such a high number of defections. The teachings haven’t changed though I think the quality of teaching has declined, not just in our schools and PSR programs, but at home, too. One of our eighth-grade confermandi was overheard at this month’s PSR mass to say “Thank goodness that’s over. We don’t have to go to mass again until confirmation.” Shouldn’t the weeks just before the final sacrament of initiation be the time when our faith is the strongest? This young person’s comment doesn’t bode well for his/her future faith life. It definitely doesn’t reflect well on the teachers and the parents who are supposed to be preparing our young people for a life of faith. Of course, the $64,000 question is this: What are we going to do about it? Jesus told us that the faith would endure. Even the gates of hell will never prevail against it. Remember, when Jesus said this, you could fit all the Christians in the world in a college football stadium with room to spare, and they were subject to much persecution, even martyrdom. Are we headed back to those times? I don’t know. What I do know is this. If we’re lackadaisical about our faith, what kind of example are we setting for others? If we’re embarrassed by the label “Christian” then we’re not likely to attract new followers, or even to keep the numbers we have now. I think I may have said this before on this blog, but if you find a new restaurant that has excellent food, great service, and reasonable prices, aren’t you going to tell your friends? Aren’t you going to recommend the place to everyone you know? Might you not even ask a good friend to join you there for dinner? The answer to all three questions is a resounding “yes”. As Catholics, we have access to food that’s greater than any earthly meal regardless of the price. We have the Body and Blood of Jesus Christ, offered up for our sins, able to bring us to everlasting life. If you’re not encouraging the people you love to join in this feast, you’re not much of a friend, are you? Jesus calls us His sheep. Not just in today’s Gospel, but He often uses that analogy. Naturally, if we’re sheep then Jesus is our Shepherd. Like a lot of things in the scriptures, this “sheep thing” isn’t as simple as it sounds. While we Americans may think of cuddly lambs, plush sheep like my friend here, and cartoon sheep that try to sell us mattresses, in other times and places sheep are an entirely different animal. If we knew more about sheep, we might understand Jesus’ message a little more clearly. If anyone other than Jesus called us sheep we could take offense. Sometimes you hear atheists or agnostics refer to Christians as “sheep” and it’s not a compliment. The four-legged variety are dirty and smelly. Until recently it was thought that sheep were stupid; blind followers with no minds of their own. That’s not true. According to recent research, sheep are as smart as cows and almost as smart as pigs. You can even teach a sheep to do tricks, if you have a lot of time. They can learn their names and pick their shepherd out of a crowd. You and I don’t run into a lot of sheep. In fact, unless we go to Grant’s Farm, or the zoo, or Our Lady of the Snows at Christmas, we could go our whole lives without ever seeing a sheep in the flesh, or in the wool. In other parts of the world, the lowly sheep is much more common. When Jan and I were in Ireland sheep were everywhere. Well, maybe not everywhere. I don’t remember seeing any in Dublin. But once you leave the city, they’re everywhere. That’s why the really good sweaters come from Ireland. Lots of sheep make lots of wool. 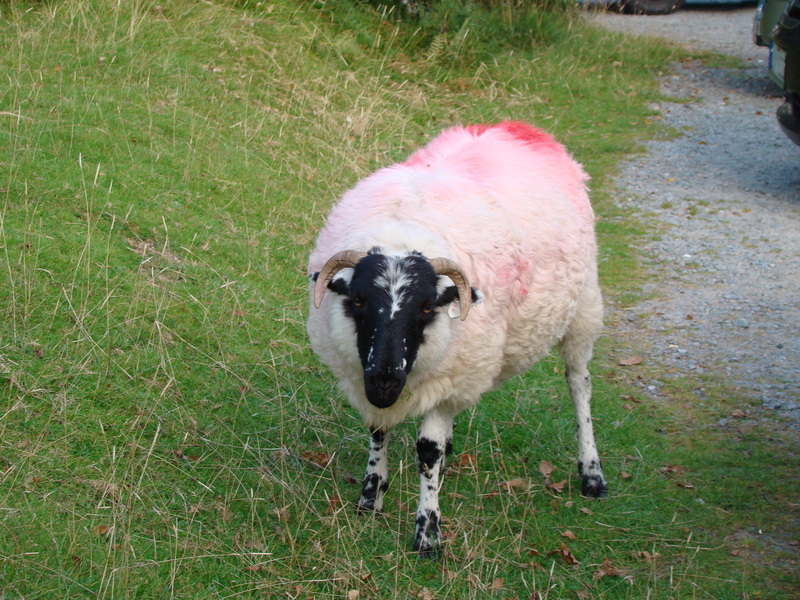 It’s strange seeing all those Irish sheep because most of them are spray-painted in different colors. That’s so the farmer can pick out his own sheep when they all wander off down the road. When the sweater factories get the wool, they have to bleach it to get it back to its natural color. But, I digress. Poorer countries depend on sheep because they can’t afford cows and pigs and hot and dry countries depend on sheep because cows and pigs aren’t happy living in the desert. Some people serve Lamb for Easter dinner but it’s still not something you normally see on a lot of restaurant menus the rest of the year. Here’s something you may not know. Lamb is the meat of young sheep. Mutton is the meat of older sheep. Real Irish stew is always made with lamb. Sheep are one of the few animals you can use to make clothing more than once. Where you can’t make a pair of shoes out of a cow without killing it, sheep’s wool can be harvested every year. Maybe they’re smarter than cows after all. The sheep is a very versatile animal. Here’s another fun fact about sheep. Their field of vision is 320 degrees. They can see behind themselves without turning their heads. It’s hard to sneak up on a sheep. Sheep are known to be meek and mild. When someone is less than bold, we say they’re sheepish. We call someone a wolf in sheep’s clothing when they pretend to be our friend when they’re actually something else. My friend here is a black sheep. He lives on top of my computer monitor. 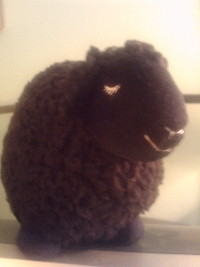 I keep him there to remind me that sometimes I’m the black sheep of the family. That’s probably a lot more than you want to know about sheep, but there is a point to all this sheepology if you bear with me. Jesus said: “My sheep hear my voice; I know them and they follow me.” Jesus and His listeners understood sheep behavior. Even though it took the scientists twenty-one centuries to prove it, sheep recognize their shepherds and will follow them anywhere. The same holds true for us. Jesus IS our shepherd. You and I hear His voice and follow. Not because of some herd instinct that’s programmed into our minds at birth, but because we understand that He is the Way, the Truth, and the Light. Here’s one more interesting sheep fact. I promise this is the last one. Sheep are afraid of shadows and will always move from the darkness into the light. That applies to most humans as well. Jesus, the Good Shepherd calls us to follow Him from darkness into the light. If we’re smart, as smart as a sheep, we’ll follow Him. In Jesus’ day, shepherds were outcasts from society, mainly because they smelled like sheep and because their job didn’t allow them much time to hang around with people. We know that Jesus became an outcast too. Not from his sheep, they (or should I say we) love Him and will follow Him wherever He tells us to go. But His teaching was new. It was dramatic. To the powers that be, it was outrageous! John says in the second reading from Revelation, “For the lamb who is the center of the throne will shepherd them and lead them to springs of life-giving water, and God will wipe away every tear from their eyes.” Wait a minute. Is Jesus a shepherd or is he a lamb? Which is it? The answer is that He’s both. He says in the Gospel, “The Father and I are one.” Jesus is God. But he became man so He could die and be resurrected to save us from our sins. The shepherd became a sheep who became the glorious Lamb seated on the throne. If we follow His lead, listen to His voice, and do what He tells us, one day we’ll join Him. Finally, today is the World Day of Prayer for Vocations. We need human shepherds to stand in for Jesus in the vital work of leading His flock. We’ll pray for vocations in today’s petitions, just as we do every week. Please remember to put in a word for those who might be discerning a call in your daily prayers, too. When I think of Saint George I think of him slaying the dragon. The story goes that he was riding one day in the province of Lybia and came to a city called Sylene. In the marsh outside of town there was a huge dragon. The locals had tried to kill the beast but it was too much for them. 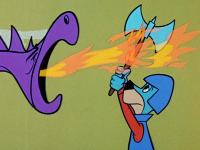 To keep the dragon from eating them, the townspeople gave it two goats each day as a sacrifice. Sometimes they would run short on the goats and would have to sacrifice a villager. They chose the victim by drawing lots. On this particular day, the princess had won the lottery and was on her way to be eaten when George jumped in and killed the dragon with one mighty swipe of his sword. As you can imagine, the people were very impressed, especially the princess’ father. George’s condition for getting rid of the dragon was that the villagers would believe in Jesus Christ and become baptized. There’s no reason to believe that this story actually happened but it showed the respect that the people had for George’s abilities as a soldier and evangelist. George was a real person and some of the legends that surround him are surely true. We just don’t know which ones. Of course the Church doesn’t normally canonize people just because they were soldiers. That’s really not our style. But apparently he was a model Christian. George lived in the 300’s yet was reported to have been seen helping the troops at Antioch in 1098. Richard I came back from the crusades and spoke of the great power of St. George’s intercession. Most likely none of us will ever be called to be soldiers, but it’s good to know that our young men and women who are serving our country have a patron to call on. Let’s pray that Saint George is watching over all the brave volunteers making so many sacrifices to keep our land free. When I was in formation one of the instructors told the class that we should always keep today’s first reading (Acts 7:51—8:1a) in mind. Steven, the first deacon, was doing just fine until he opened his mouth. Then he was stoned to death. People are seldom stoned to death, at least not in the United States, but the point is still well taken. The thing is, the words Steven spoke to the people were all true. They were “a stiff necked people.” They had “received the law as transmitted by angels, but (they) did not observe it.” Sometimes, the truth hurts. So where does that leave modern-day deacons and priests. Do we tell the truth risking the wrath of the congregation, or do we just sugar-coat everything, give the folks what they want to hear, and become everybody’s friend? Sadly, I’m afraid many of us chose the former and I’m afraid that’s what’s wrong with the Church today. Jesus’ message hasn’t changed but many of the messengers just aren’t up to the task, your’s truly included. Being only human, it’s nice to stand in front of church after mass and have people say “nice homily”, but is that why I was ordained? I don’t think so. Is it my job to make people feel good or to make people be good? When I stand in judgment before Jesus is He going to look me in the eye and ask me why I didn’t use my preaching faculties to help His people get into heaven? If He does, how will I answer Him? Since Vatican II, I’m afraid we may have gotten too warm and fuzzy in our preaching. Want proof? Just watch the 10:00 news or read your local paper. Maybe it’s time to bring back “fire and brimstone” preaching. Maybe it’s time to remember that the tablets Moses brought down from the mountain weren’t the Ten Suggestions. Maybe it’s time to point out that Satan is alive and well and walking among us. Maybe it’s time to go back to literally scaring the hell out of people in the pews. Here we are, in the midst of the Easter season, just sixteen days since we celebrated the Lord’s resurrection. The huge crowds that filled the churches on Easter Sunday have gone back to playing golf or sleeping in on Sundays. For those of us who have the privilege of speaking from the ambo, it’s time to get serious about the souls that have been entrusted to us. If we end up getting stoned, we’re in good company.